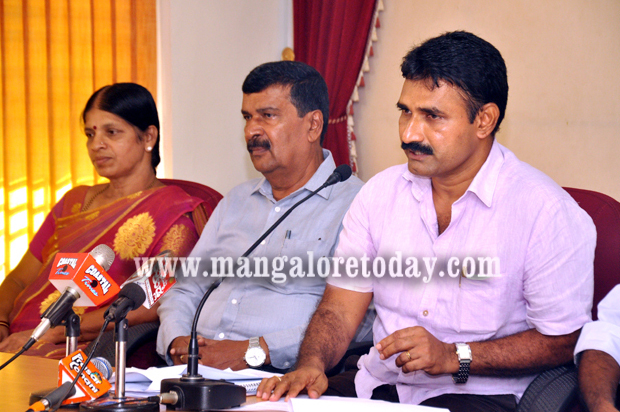 Mangaluru, Dec 19, 2015 : Addressing media here on Dec 18, Friday, Leader of the Opposition in the MCC council Sudhir Shetty Kannur said the corporation had availed the Asian Development Bank loan a decade ago for water supply and laying underground sewage network, under the Karnataka Urban Development and Coastal Environmental Management Project. Neither the loan repayment has begun, nor the project has been completed. The project was launched in 2003. Of the 4.95 lakh population under the jurisdiction of the MCC-Mangaluru City Corporation, each one is saddled with a loan of at least Rs. 9,111 for infrastructure project in the city. This is according to the opposition BJP in the city corporation council. S S Kannur said the corporation, through the State government, availed Rs. 258 crore loan for the project. Interest on the loan amount at the end of March 2015 stood at Rs. 193 crore, making the total outstanding loan at Rs. 451 crore. If it was to be repaid, each one, based on population, would have to shell out Rs. 9,111 now. This would only increase as the interest amount has been calculated only till the end of last financial year. S S Kannur questioned the corporation council’s proposed move to get the second instalment loan of Rs. 280 crore from the ADB again, for the second stage of sewage and water supply work, without completing the first stage. The BJP alleged that the corporation has sent Rs. 160 crore proposal to the Union government under the Atal Mission for Rejuvenation and Urban Transformation scheme, without bringing it to the notice of the Opposition. The proposal has been prepared unilaterally without placing it before the council for debate and approval. He said the BJP in the next meeting of the council would press for revising the proposal and resending it to the Union government.